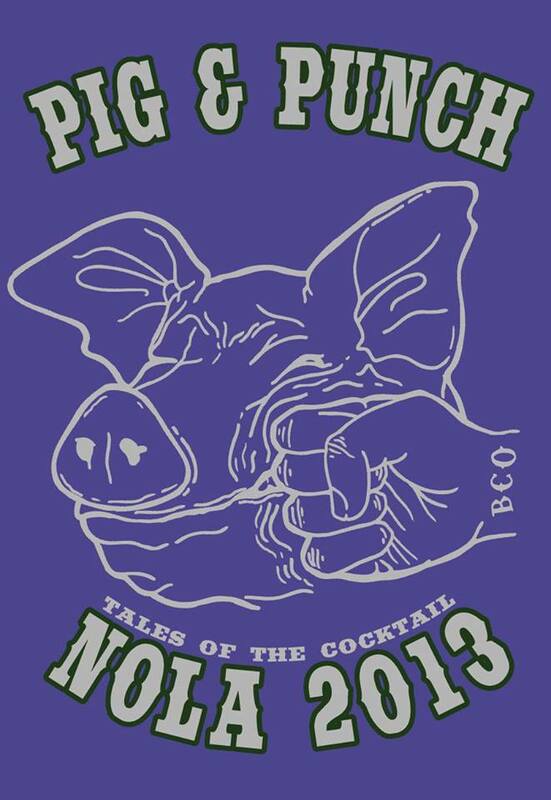 Pig & Punch! Bartender Nick Crutchfield from Virginia showing how it’s done! 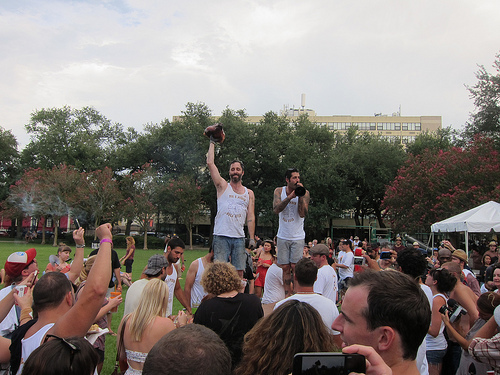 If you’re heading to Tales of the Cocktail, be sure to stop at the Bon Vivants’ 4th Annual Pig & Punch on Sunday, July 21 at Washington Square Park in New Orleans. 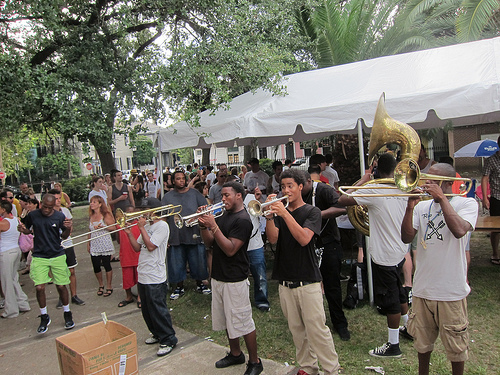 Money raised goes towards New Orleans KIPP Charter Schools. The admission gets you a nifty t-shirt, fabulous pork & sides, all you can drink punch, plus fun times hanging out with pals. Dance to the live music or take a snooze on the grass, either way it’s going to be a good time. I had a wonderful time at last year’s party. I wish I was going this year! 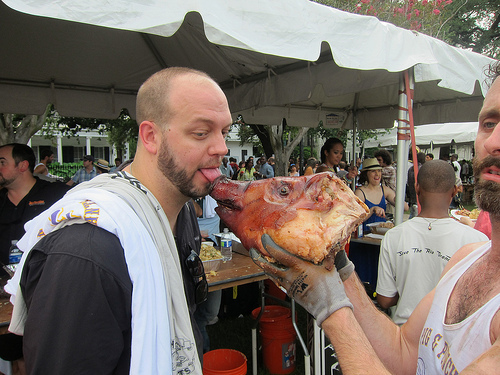 Eat plenty of pork for me! 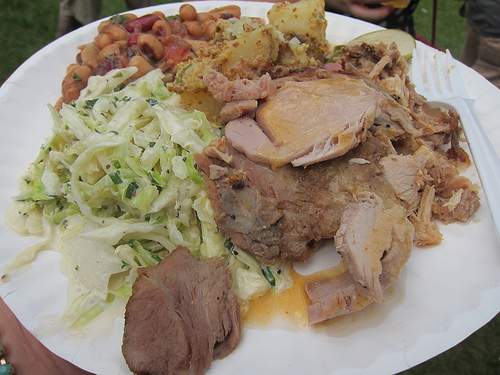 The pork is awesome but Scott really does a great job with the sides too. The slaw was the best! 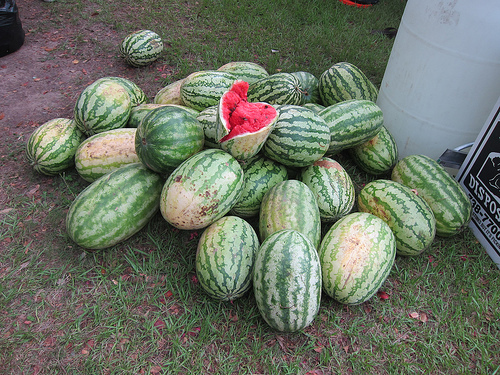 And no picnic is complete without watermelon. Last year they had boozy snow cones in addition to the punch. And I found plenty of friends offering beer and other drinks so come prepared to share. Triple Buck with the Bon Vivants– the first time I had these guys’ BBQ! This entry was posted in alcohol education, alcohol tasting, bartenders, cocktail week, cocktails, events, history, hot bartenders, spirits, the minty, travel and tagged bartenders, bbq, charity, cocktail week, events, fun, fundraiser, good times, music, new orleans, nola, pig, pig and punch, pork, tales of the cocktail, the bon vivants, totc, totc 2013. Bookmark the permalink.